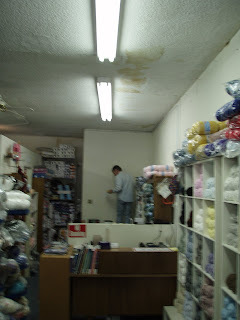 Kyle Knits - a boy, his cats and way too much yarn: Painting Progress at Bishops Yarns! Painting Progress at Bishops Yarns! On Saturday, I spent the day at Bishops painting and patching. Terry (one of the girls that works there) enlisted her husband (Lloyd)to help me patch and move things around. We had bought the paint a few weeks ago but I have been busy and had to go to Indiana to say goodbye to my dad. Dad isn't doing well; he's on morpine and an IV, and they have stopped the chemo... he's in his last days - so that trip was important. Anyway, when we got to the shop, not much had changed with regard to the back. The girls have been working diligently at getting as much yarn out of BAGS as possible (they have been having great sales days since they started taking stuff out of plastic!) - we started taking down all the posters, etc. and Lloyd was patching - I put in a "Before" and "After" so we can see the change. We painted some of the walls (the accent walls) a mossy/olive green - and it looks so nice! We are going to put up some shelving on the back wall - between the two green walls - That back wall that goes against the very back of the store will be painted some sort of pumpkin or rust color. We haven't figured out what the store will be painted (the main part of the store) but I think we're going to end up with some sort of cream or yellow or maybe the ralph lauren "Devonshire" color that looks like a manilla folder. We need to do something with the ceiling, but charity has to stop somewhere! Florence (the shop owner) loves what we have done and is much better than she was when we took her to the hospital. She spent a week or two home, lost 15 pounds (she started off skinny as a rail!) - but she's getting better. SO. That's how I spent my Saturday. I am happy and it looks nice. 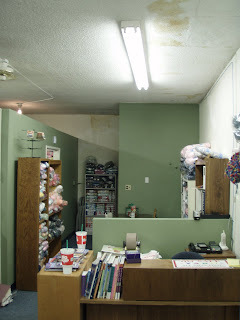 The people who are coming into the shop are happy with the way it looks, and I can honestly say that there's a difference in the sales in the store - directly resulting from the rearranging of the shop and the small cosmetic changes we have made. I was also thinking of hanging a curtain back where those shelves will be (to hide the backstock) - what do you think? the charity shall continue. it's good to do for others! If you have room on the wall why not display some finished sweaters or a shawl or something like that?